Mustonens Anschlagskunst grenzt an Magie. (...) Mustonen artikuliert durchwegs mit äußerstem Differenzierungsvermögen: Es tun sich unerhörte Non-Legato-Welten auf. Auch das Pedal weiß er effektsicher, malerisch einzusetzen. Diese Musiker gehen mit solcher Frische des Geistes und Herzens zu Werke, dass allfällige ‚stil-kritische’ Bedenken philiströs, ja albern erscheinen. (...) Dass Hans-Werner Küthen vom Beethoven-Archiv Bonn als Autor des (ungemein aufschlussreichen) Beiheft-Texts gewonnen werden konnte, spricht für die hochseriöse Machart dieser Produktion. 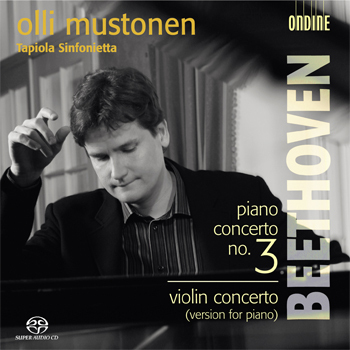 On this excellent recording, (Olli Mustonen) combines at least two of his talents, conducting from the keyboard a fresh rendition of Beethoven's Piano Concerto No. 3. The Tapiola Sinfonietta in particular is on terrific form and Mustonen's playing occasionally has the grandeur of an aristocrat. Theirs is an interpretation that avoids the routine (...). These incident-packed, often arresting performances enjoy excellent reproduction - Mustonen is naturally balanced with the orchestra, his soloist-and-director role here apppositely underlined . Mustonen's performance of the Third Concerto (...) is one of the finest on disc: big-hearted and free from the Haydnesque prissiness that some interpreters bring to the work. The Tapiola Sinfonietta's playing is sensational, too. Here is playing of great force, brilliance and exactness. It's musical, full of life, and certainly makes you consider the (Violin Concerto) in a new light. (...) fascinating, limpid account of the piano version Beethoven made, at Clementi's request, of his own violin concerto. Listening to Olli Mustonen's interpretation of Beethoven's Third Piano Concerto is a refreshing experience; instead of emphasizing the tragic melodrama, Mustonen brings out the music's intimite character. It is a thrilling listen. Empahtically phrased, with piquant sforzandi from the strings, a warm woodwind sound and brilliantly clear textures from the piano, it is a testament to the vitality of interpretations that do away with the middle man. Olli Mustonen continues his acclaimed cycle of Beethoven Piano Concertos. In this second volume, the visionary Finnish pianist and conductor turns his talent to the Third Piano Concerto in C minor and the Piano Concerto which Beethoven arranged himself from Violin Concerto of 1906. While this Piano Concerto is seldom played in concert, with only a handful of recordings available, Mustonen regularly puts it on his programmes, and it has become one of his signature pieces. As on the previous disc, Mustonen performs with the Tapiola Sinfonietta, with whom he has maintained close artistic ties for years, accompanying this Beethoven project with acclaimed tour performances in various European countries. The booklet includes extensive liner notes written by noted Beethoven scholar and author of the new complete Piano Concerto Edition, Dr. Hans-Werner Küthen of the Beethoven-Archiv, Bonn.